Laundry – 13Ft Ironer | Hercules Machinery, Inc. Designed to streamline laundry operations with unique features that ensure improved flexibility, heightened production and the highest-quality finishing standards, Continental’s Pro-Series F13 Flatwork Ironers are ideal for medium-volume laundry applications. Available in 61 and 76 inch widths and gas or electric models, F13 Ironers properly finish damp linens without need for costly dryer conditioning. The F13 features a 13 inch diameter roll and wax-less operation. The Kinematic strap tensioning system ensures optimum ironing quality. The ironing cylinder is made of machined-steel, mirror polished and finished in chrome. Autospeed automatically adjusts the ironing speed to assure a constant ironing temperature and even drying. 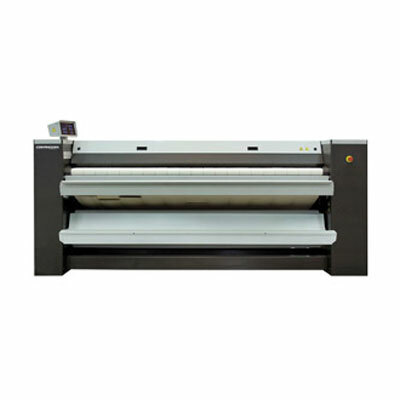 The programmable microprocessor control enables Pro-Series Ironers to be customized to match a variety of user needs.